I got this private message on Instagram, so I knew that now was for sure the time to address it. Quick question! I see you showing and talking about a lot of probiotic supplements or other products. Why do we need to take these things? Shouldn’t our bodies have enough of this naturally and with proper nutrition? Taking additional pills and/or other products seems so unnatural. Also, thank you for all the inspo on your channel! Love this question and these honest thoughts so much. The Gutsy ‘gram community is phenomenal! Why Supplement in the First Place? In theory, our bodies have enough of all the right things and no supplementation is needed. While the body is extremely intelligent and capable of knowing what and how to get what it needs, these days there are gaps in our diets and illness which can cause damage needing re-building. Nutritionally, HERE is what you need on a daily basis. This is how the majority of people supplement – to fill in the gaps of where they might not be getting enough nutrition from food. But supplements extend far beyond the multivitamin or a general dose of Vitamin C.
Or is the real reason we supplement so much due to marketing? My honest opinion? Both. Some of us need to supplement, but some of the supplementation we’re doing is unwarranted – due maybe more to marketing than anything else. 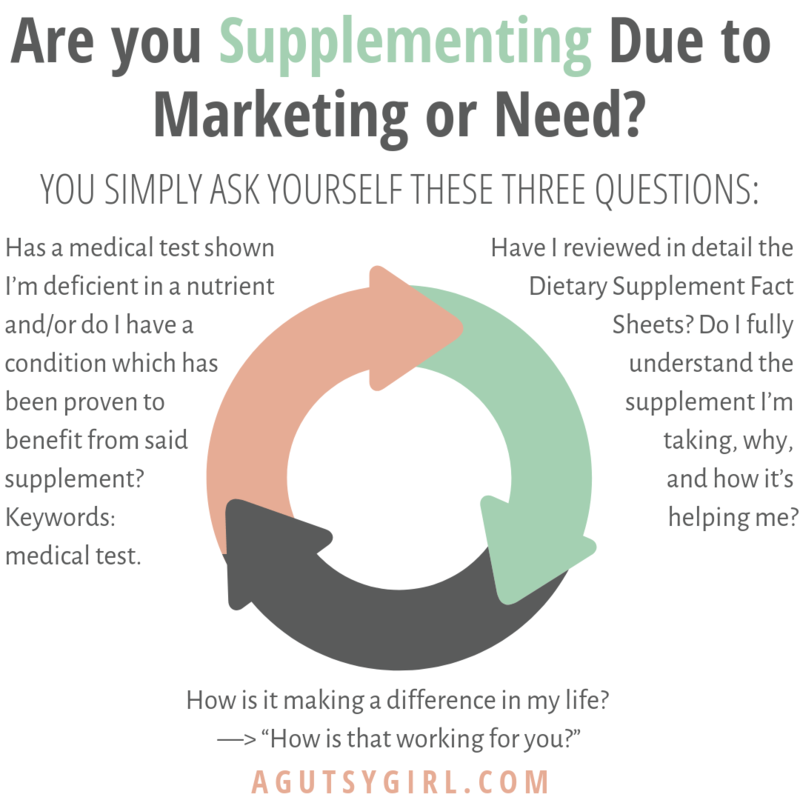 Are you Supplementing Due to Marketing or Need? Click HERE to save this graphic for later. It’s very easy to determine which category you fit under: marketing or need. Has a medical test shown I’m deficient in a nutrient and/or do I have a condition which has been proven to benefit from said supplement? Keywords: medical test. Have I reviewed in detail the Dietary Supplement Fact Sheets? Do I fully understand the supplement I’m taking, why, and how it’s helping me? Which of the three do I think can be most useful for you today? Number three. You’re taking 17 supplements, but you are still not feeling anywhere near well. Do you think the supplements are working? You believe you need the supplement, but then there is still more drilling down that needs to happen. Time for a story with supplement practical applications. Marco Polo is the best ever. My three BFF’s and I communicate on it daily. When we wake up, we share about the day ahead and at the end of the day, we recap our days. It’s such an awesome way to feel connected to them as people, friends, and moms. Both friends had the same problem and same end goal, but the approach perhaps should not have been the same. One had an ant and mouse problem; the other, just a mouse problem. This is like supplements. Just because your friend is taking a probiotic because her stomach is off from a round of antibiotics doesn’t mean that the same probiotic will work for you – you who has an off stomach, SIBO-specific, and Hashimotos. 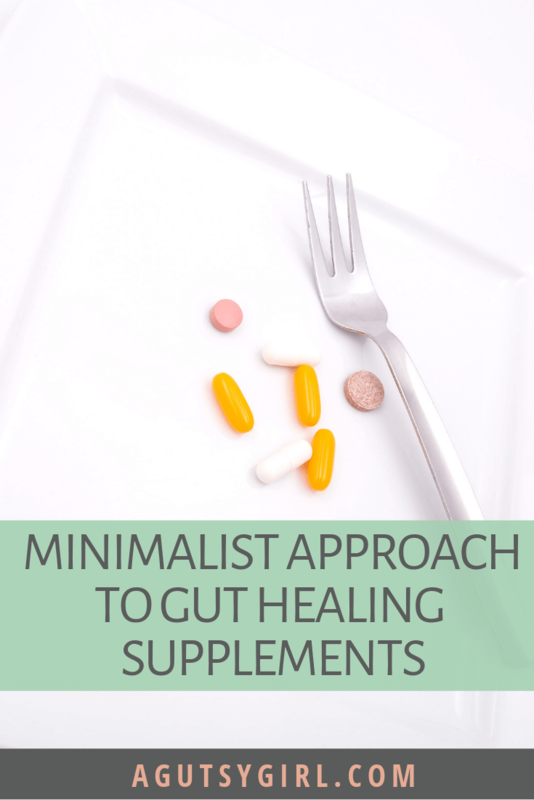 Now, I’m going to give you my minimalist approach to gut healing supplements. Yes, yes I have taken all of these Recommended Supplements at one point or another. If I didn’t, I wouldn’t recommend them. But I’m far from taking them all (or even that many) today. I’m not sure. Even if it did help, what helped? What’s working? If you are taking all the supplements, all the time, then how can you really be certain of which are working or are not working? You can’t. Digestive Enzymes. I have always used this brand, but I am exploring others currently as well. Probiotic. Learn more by starting with, All About Probiotic Strains and Species. Activated Charcoal. By the way, I’ll be exploring this one more for you via A Gutsy Girl soon-ish. While I now take a minimalist approach to gut healing supplements (and believe you should do the same), I’ll continue sharing all about different supplements, all the time – whether or not I take them both here on the blog and for my Instagram Supplement Sunday feature. Why? Go back to my peanut butter, ants, and mice analogy. The supplements on my list above might be completely irrelevant for you, but something like Adrenal Glandular (which I no longer currently need) might be very relevant. I’m here for you now that I have healed to the place I have. The goal is to provide any and all information possible, and then leave the decision up to you (+ your doctor). Questions? Also, I’m always up for investigating new supplements – leave your requests in the comments below. Hi! Thanks for all your info. Can you explain why you take the supplements you take? I have Crohns and was taking digestive enzymes until I got the diagnosis – I assume you only need these enzymes if you lack them (which is not the case for someone with crohns). Do you lack these enzymes? Why HCL? Was there a test you took that showed you were deficient in stomach acid? Is that a test we should all be taking? Re L-Glutamine – the reviews of the one you use mention having to take it on an empty stomach (one reviewer says to mix it up and leave it by your bed and drink it when you wake up in the night to pee) – do you do that? And do you take 5mg as per the bottle or 10mg as some reviewers suggest…? Many, many thanks!